Providing the expertise of a seasoned Wealth Management Professional since 1993, John has successfully guided his clients through all sorts of market conditions. Believing that knowledge is power, John strives to educate his clients. As a Certified Financial Planner®, he listens to your needs, analyzes your data, formulates a plan, and then implements your investments using tactical portfolios. John graduated from the University of California, Irvine in 1978 with a Bachelor of Science degree in Civil & Environmental Engineering. In 1980 he earned his MBA from the University of Southern California. In 2006, to deepen his knowledge of Investments and Financial Planning, he earned the Certified Financial Planner™ designation. This designation helps John understand the processes of Investment, Income Tax, Retirement, and Estate Planning in greater depth. 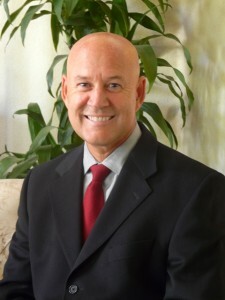 John has been named a Five Star Wealth Manager each year since 2012, and is recognized in the Orange Coast magazine. John resides in Dana Point, California, with his wife of 30+ years, Debbie. They have three adult children, two sons and a daughter. John was the Treasurer of the St. Catherine’s School Board and the President of the Santa Margarita Catholic High School Football Booster Club. John and Debbie also have the distinction of being the US National Senior Roller Dance Skating Champions from 1974 – 1978. In their free time they enjoy an active lifestyle traveling, skiing, and golfing with family and friends.